This week is the release of The Complete Angel Island Series, a box set that includes all three of my Angel Island companion novels, Waiting for the Storm, After the Storm, and Take Them by Storm. 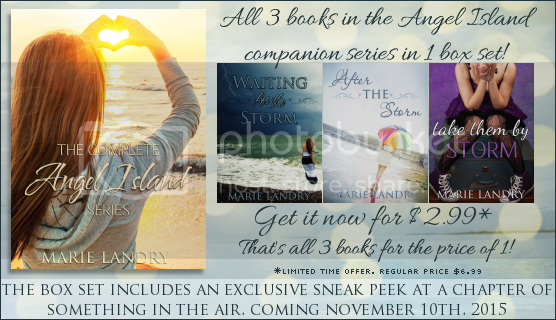 For this week only you can get the set for just $2.99 - that's all three books for the price of one! If you're curious about the series and haven't started it yet, or if you've read one but not the other two, now would be a great time to give them a try! To celebrate the release of the box set, I'm dedicating this week to posts about the series. On Monday I kicked things off with fun facts about the series, on Tuesday I shared pictures inspired by the books, on Wednesday I shared an excerpt from the first book in the series, Waiting for the Storm, and yesterday I shared an excerpt from the second book, After the Storm. 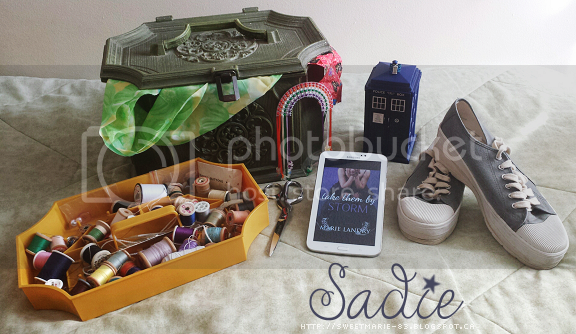 Today's post is Sadie's Take Them by Storm Playlist from - a mixture of songs she listens to or mentions in the book, and songs I listened to while writing. I hope you've enjoyed this week of Angel Island posts! I adore the picture you took to capture Sadie! I would love to see pics like this for all your characters! HAHA you know me too well! Sadie has a tattoo with U2 lyrics, so that kinda makes up for it. I think there are only two on Rose and Declan's playlist, so I REALLY slipped there!